Written by Robert Harling of Natchitoches, Steel Magnolias carries on the successful tradition of the hit off-broadway play by the same title. The moving, bittersweet story line centers around six women in a small southern town who comes to terms with life, death and marriage. Steel Magnolias offers a most unique blend of comedy and tragedy as stars Sally Field, Dolly Parton, Shirley MacLaine, Daryl Hannah, Olympia Dukakis, and Julia Roberts weave the variety of southern life on film. The film’s producer, Ray Stark, realized the potential of Harling’s work, and insisted on the best for its development. He proved this by securing an outstanding cast of stars, and by obtaining Herbert Ross as the film’s director. Additionally, he sought a location community that would reflect the endearing qualities of the story’s setting. Without question, the search ended where the story began: Natchitoches, Louisiana, the actual setting of the true life drama depicted in the movie. Many well-known area locations, including Northwestern State University campus, the riverfront area on Front Street in the National Landmark Historic District, Trinity Episcopal Church, and the Henry Cook Taylor home were chosen for important scenes in the film. In fact, in the summer of 1988, Natchitoches experienced a flurry of activity and excitement as production for Steel Magnolias took place. 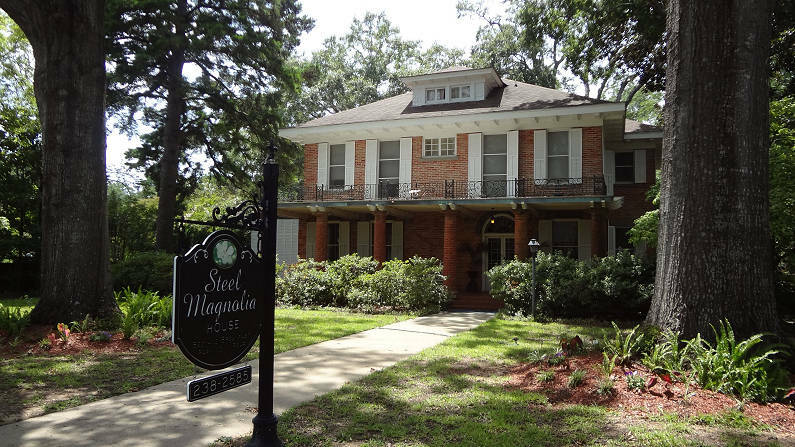 The Henry Cook Taylor home was renamed The Steel Magnolia House and is currently operating as a Bed and Breakfast. 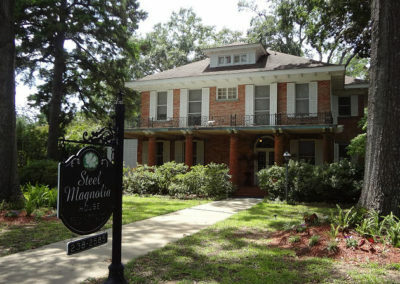 Filming locations for Steel Magnolias offer an enjoyable walking/driving tour of Natchitoches. The charming qualities of our 275 year old community and its friendly, caring people were a perfect blend for the filming. Throughout Natchitoches, the support that six characters extended to each other through the events in their lives is obvious. Weddings and receptions at elegant homes, fun and frolic at the “Festival of Lights“, and daily exchanges at the beauty shop are just a part of many scenes in this historic community. I do not see plays, because I can nap at home for free. And I don’t see movies ’cause they’re trash, and they got nothin’ but naked people in ’em! And I don’t read books, ’cause if they’re any good, they’re gonna make ’em into a miniseries.